The famous Gateway Arch, visible in the background of Granite City, Illinois, is a reminder of the area’s legacy as “the gateway to the West”—a final stop on the way to freedom andopportunity. Today, however, a far different kind of journey isoften made to Granite City, located very near St. Louis,Missouri.“ Those steel mills used to draw people [here],” said Angela, nodding toward the empty buildings and idle smokestacks. “Now it’s the abortion mill.” Angela and Daniel Michael keep a regular vigil outside the dubiously named Hope Clinic for Women in Granite City, as they have for the past 17 years,with their Small Victories Ministries pro-life outreach. They keep watch with a few of their 12 children, persuading women to reject the false freedom offered by the abortion business. Due to the state’s lax restrictions and the death of George Tiller, the Hope Clinic is now the only facility in the region providing late-term abortions. As a result, women come from far and wide. On a typical day, license plates in the parking lot represent a 10- state area, including Kansas, Missouri, Iowa and Arkansas. While the variety of license plates doesn’t surprise the Michaels, the number of Christian insignias does. 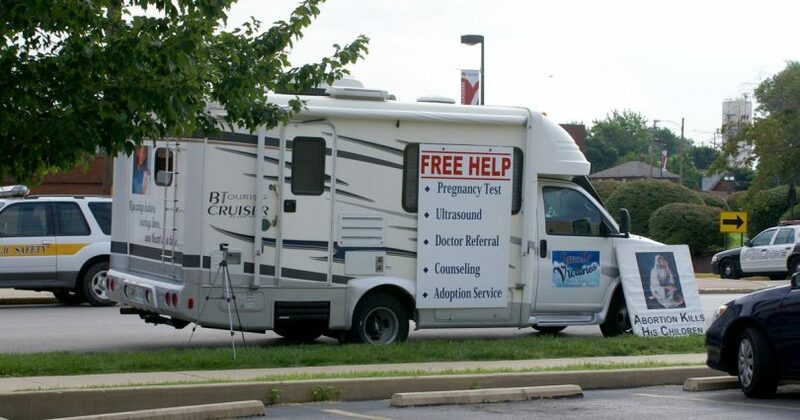 “What kills [us] are the people who show up with crosses and fish [symbols] on their cars or even church vans,” said Daniel, who has sent pictures to pastors who are stunned upon learning that their vehicles were used to shuttle women to the abortion facility. Angela keeps meticulous records of their observations on the Small Victories web site. This documentation has even been requested by law enforcement personnel seeking information on pedophiles that transport their victims to Granite City to obtain abortions. Another factor that accounts for the Hope Clinic’s popularity is the lack of local support for pregnant women. “There’s no place here that helps girls,” said one woman who met with the Michaels to pick up resources. Small Victories is the only ministry in the area that provides supplies such as baby furniture, diapers and food for mothers and their babies. The path the Michaels have chosen is not easy. Angela left a nursing career, realizing that her skills were best used in a more proactive ministry. They support their family on Daniel’s part-time job as a server at a restaurant owned by his brother. Even that small income was lost for awhile when he was fired for opposing abortion. The Michaels discovered that one of the Hope Clinic employees was running a small side business hosting birthday parties for children. They publicly protested, drawing attention to the irony of denying children their right to be born on the weekdays and celebrating birthdays on the weekend. Fearing a lack of support from the community, Daniel’s brother fired him and took out ads in the local paper denouncing his actions. One cold winter night, when the Michaels had no job, no income and 11 children to support, Angela was talking to a woman about to enter the clinic to get an abortion. The woman asked Angela if she was willing to adopt her preborn child. She said yes, despite every reason in the world to say no. The adoption of Hannah-Noelle changed hearts. Daniel’s father, who considered himself “pro-choice,” realized how close his beloved granddaughter came to looking like one of the grotesque abortion pictures his son and daughter-in-law display. And he was not the only one moved by the heroic rescue: Daniel got his job back at the restaurant. Disputes and persecution are regular occurrences for the Michaels. They have fought restraining orders, as well as filed and provided evidence of malpractice charges for botched abortions many of which end in a settlement and a gag order, despite their photographs of wheelchairs and gurneys with women in bloody sheets being wheeled across the street to the hospital. The cases are numerous; two new malpractice cases were reported in July 2009 alone. “Back-alley abortion has not ended; it just costs more,” says Angela. The Thomas More Law Center has provided legal assistance that has successfully protected the Michaels against spurious criminal charges and attempts to pass city ordinances that would make sidewalk counseling illegal. And the backlash has not been limited to the legal arena. “Neighbors” have thrown garbage into their yard, persecuted their children at school and protested outside their front door, loudly objecting to the Michaels’ courageous stand for life. The Michaels started out with an ancient-looking ultrasound unit in the family van so women could see their babies before they made the decision to abort. Thanks to money raised by supporters, they upgraded to a small recreational vehicle equipped with a bathroom and climate control system for privacy. “Since we’ve had the new vehicle, the ultrasounds have tripled,” Daniel reported. They have never had a single mother abort after seeing her baby—an amazing 100-percent save rate. According to Angela, this is the most important aspect of providing last-moment counseling to expectant mothers. The RV is also stocked with supplies, snacks, models of the baby’s development in the womb and American Life League’s Baby Steps DVD. “This is what God called us to do, to be embedded, to be like ‘special forces,’ because this really is the frontline, the last line of defense for these babies,” said Angela. The effects of the Michaels’ long entrenchment are showing. The Hope Clinic used to commit 250-300 abortions per week, but now does about 100, according to Angela’s records. The Michaels have also talked several employees into leaving and are still in contact with some of them. The former employees have helped to confirm useful details, such as the staff’s big fear of malpractice suits and the fact that the facility aborts children beyond the 25th week of pregnancy.